The Novar Fishings comprise about 6.2 miles (10 km) of double-banked salmon fishing, split into 6 rotating beats over two sections of the river: the upper beats comprising Beats 1 and 2; and the lower beats comprising Beats 3, 4, 5 and 6. 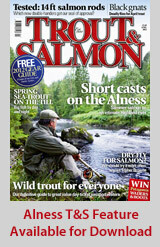 The upper and lower beats are split by about 2.3 miles (3.7 km) of fishings controlled by Kildermorie and Ardross Castle estates. The average length of each beat is just over 1 mile (1.6 km), with typically 15 to 20 named pools per beat allowing for 4 rods. Novar own both banks throughout the length of our beats. Most of the fishing is accessed from the southern (right) bank, except for some pools on Beats 2, 4 and 5, accessed by footbridge or road bridge, which are fished from the left bank only, or from both banks. Over the course of a full week's fishing, anglers will generally fish all 6 beats on the rotation, though shorter lets are also available. Examples of a full week rotation are: M6, T1, W4, T2, F5, S3 or M3, T6, W1, T4, F2, S5 etc. For spring and early summer fishing (April through July), we have reduced the total amount of fishing available to allow rotations to be offered that comprise fishing on the 4 lower beats only e.g. M3, T6, W4, T3, F6, S5. This improves prospects at this time of year. There is a considerable amount of infrastructure throughout the beats that improve access to the fishings, and provide areas to rest and 'take in' the surroundings. These include footbridges, catwalks, huts/shelters and seats. There is a fishing hut on Beat 2, and fishing shelters on Beats 1, 2, 3, 4 and 5. Directional signage on the tracks and occasional pool names along each beat, in combination with the beat maps provided, are designed to help you explore our beats. There is a Fishery Manager and a part-time ghillie on the Novar beats who will oversee your visit, and should you want them, dedicated ghillie services, and GAIC-qualified instruction & guiding are also available. 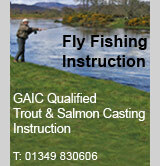 Beginners do particularly well on Novar, and there are typically 5-10 ‘first salmon’ caught here annually. Check out our photo galleries in the Guest Zone!